On February 7th 1920, Vale took part in the Scottish Cup proper for the first time, travelling to Hampden to play Queen’s Park. Queen’s were still one of the top sides in Scotland at the time and featured the legendary Alan Morton, who would go on to join Rangers and become known as the ‘Wee Blue Devil’. Not surprisingly Vale’s maiden voyage into the Scottish Cup ended with a 3-0 defeat. Vale retained the East of Scotland Qualifying Cup in season 1920-21, beating Selkirk and Edinburgh Civil Service before defeating Peebles Rovers after a replay in the semi finals. The final, against Berwick Rangers, went to three games with a 1-1 draw in Peebles followed by a scoreless draw at Coldstream. The third game took place at Caddon Park, with home advantage telling as Vale edged the game 2-1 to lift the cup for the second year running. There was also an appearance in the King Cup final, but the Innerleithen men were beaten 4-0 by Edinburgh Civil Service at Peebles. Among the famous players from this time were; Hugh Aird, Ford Currie, Andrew Dickson, Jimsie Green, Wat Kerr, Bert Pearce, Jock Robson, Andrew Turner, George Turner, George Yellowlees and Willie Wilson. With such a good side it was inevitable that bigger sides would be interested. Goalkeeper Jock Robson (reckoned by many to be the greatest player ever to represent Vale) and Ford Currie went to Arsenal, Airdieonians took Hugh Aird and George Turner, while Bert Pearce played trials with Blackburn Rovers. In January 1922, Vale found themselves drawn at home against Morton in the Scottish Cup, a top division side at the time. The game was too big for Caddon Park to host, so was switched to Greenock, with the game ending 4-0 in favour of the Renfrewshire side. Morton went on to reach their first ever Scottish Cup Final that season, a goal from Jim Gourlay enough to defeat Rangers – who featured the ‘Wee Blue Devil’ Alan Morton by this point – at Hampden and lift the trophy for the only time in their history so far. 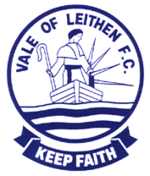 The following month, Vale won the King Cup for the first time after winning a replay against Leith Athletic. The first game at Logie Green had finished 2-2 and again Peebles was the venue for the final, with Vale winning 3-2. 1922 was also the year the club moved from Caddon Park to their present home of Victoria Park, leased from the town council. Season 1922-23 saw the club lift the Consolation Cup for the second time after beating Gala Fairydean 2-0 in the final at Peebles. Earlier in the season Vale had met Peebles Rovers in the semi final of the East of Scotland Qualifying Cup, but lost out on a place in the final as Rovers ran out 2-1 winners in front of a crowd of 2000 spectators. In season 1924-25 Vale did win the East of Scotland Qualifying Cup, beating Clerwood 1-0 in the final. A new version of the Eastern League was formed in 1921, comprising Vale, Gala Fairydean, Peebles Rovers and Selkirk from the Borders, along with Edinburgh sides Edinburgh Civil Service and Civil Service Strollers. This lasted just one season though and Vale returned to playing in the Border League. But it was a haphazard affair, with clubs playing fixtures whenever they wanted and many seasons ended unfinished, which was often the way football was in those days. The East of Scotland Football Association decided to step in and form the East of Scotland League in 1923, which featured the participants from the ill-fated last Eastern League – apart from Peebles – plus two more Border clubs in Berwick Rangers and Coldstream. Edinburgh Civil Service dropped out after six games of the season and were replaced by Leith Amateurs from the Lothian Amateur League. Coldstream were the first winners of the East of Scotland League, but the following year Vale took the championship, losing only one game and with a goal difference of +32. Vale had mainly drawn players from Innerleithen and Walkerburn, but transport links were improving with Harper’s Buses from Peebles and Brooke & Amos from Galashiels providing regular bus services to the area. The result was that players were starting to move to and from other areas. Peebles Rovers were playing in the Scottish League 3rd Division at this time and a number of players moved between the clubs, with local men Wat Kerr, Andrew Dickson, George Turner, Hugh Aird and Bert Pearce seeing Scottish League action with Rovers. Peebles players who gave service to Vale included Ben Greaves, Pens Anderson, Jim Dodds, Donald Murray, Cuth Wells, Same James, Tony French and Sandy Euman. Players from Edinburgh also started to feature in the Vale team. In fact such was the movement of players that when the club party boarded the train at Innerleithen Station en route to the Scottish Cup tie at Brechin in 1927, only two local players – Jackie Patterson and Bert Pearce – were alongside club officials, with the rest joining the train at Peebles and Edinburgh. The trip ended in disappointment as Vale went down 8-3 in Angus. In 1927 Vale resigned from the East of Scotland League to compete in the Edinburgh & District League, which had been formerly known as the Midlothian Junior League and was run by the Scottish Junior FA. They were joined by some familiar faces as fellow Borderers Peebles Rovers and Duns also took part. This only lasted one season however, and by the time the following season came around, all three teams were back in the East of Scotland League fold, which had by now expanded to 15 clubs; eight from the Borders and seven from Edinburgh. By the end of the decade, capital sides Clerwood Amateurs and Corstorphine Amateurs had merged under the Clerwood name, while Bathgate and Cameron Highlanders had entered into the league to bring membership up to 16. NOTE: Leith Amateurs replaced Edinburgh Civil Service after six matches of the season. * NOTE: Loanhead Mayflower folded during season.